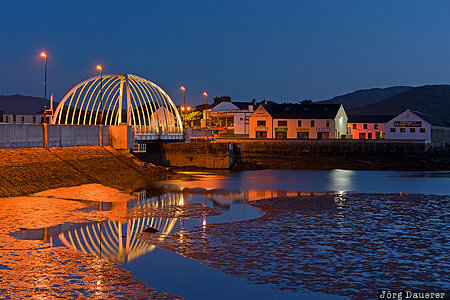 The flood-lit Michael Davitt Bridge crossing the Achill Sound connecting Achill Island to the Corraun peninsula at the blue hour after sunset. Achill Island is in County Mayo in the west of the Republic of Ireland. This photo was taken in the evening of a sunny day in June of 2016. This photo is part of the exhibition Bridges (February 2019). This photo was taken with a digital camera.